Today, we’d like to discuss creating events through Google My Business (GMB) and how this can increase attendance at your business’ events. 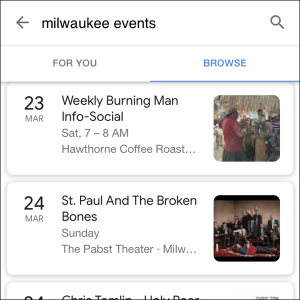 Like all posts on GMB, the events you create can be discovered through Google Search results and Google Maps. By adding events to your Business Profile, you can attract users to your website and spread awareness of your events. Add a description and details, which can be up to 300 words, and an event title. Give your event start and end dates and times. Add a call-to-action button, such as “Learn more” or “sign up” that links back to your website with more information about the event. In addition to the copy for event posts on GMB, you should always include an image. The ideal image size is 750×750 pixels—any image smaller than 250×250 pixels will not be accepted. Unlike non-event GMB posts which expire after seven days, events on GMB are live on a Business Profile until the event end date. If you’re looking to increase attendance at your events and capture your customers’ attention, contact us today and we can help you optimize your Google Business Profile.